The idea of a survival garden is simple enough – a plot of land, a dedicated garden, or a corner of the yard intended to provide you and your family with enough crops to live entirely from the produce of the garden alone (or with a minimal requirement for additional food). Whether you’re preparing for possible economic uncertainties in the future, are looking to ensure continuity after a major incident or natural disaster, or simply want to be more self sufficient in the long-run, planting a survival garden and growing your own food is one of the very best ways to take control of your food security. Having a survival garden is incredibly empowering and as well as giving you complete sovereignty over what you eat, provides total peace of mind that if times get tough – at least where food for you and your family is concerned – you’re covered. Growing and raising your own food is by no means a new phenomenon, with many people traditionally growing their own produce over the last few centuries. In actual fact, before the widespread use of industrial farming practices, fertilizers, commercial refrigeration and the convenience and economic viability of grocery stores in almost every corner of the western world, growing your own food was the often the only way for people to feed themselves, and certainly made up a core part of everyday life. Fast-forward to today, and it’s probably fair to say that most people have now become so separated from where the food on their table actually comes from, that many of the skills and techniques around knowing how to sow and grow fruit and vegetables have all but disappeared from the majority of society. This guide is designed to provide you with everything you need to know about survival seeds and gardening from designing, planting, harvesting, and using the produce from your own survival garden to allow you to take back arguably the most essential self-sufficiency skill out there and to become more resilient to any external shocks when they happen and maintain food security at home. Armed with this knowledge, a small piece of land, some survival seeds (and bulbs), and a few essential tools (more on all of this later on in the guide), you’ll have everything you need to go from grocery store dependency to food independence before you know it. So roll up your sleeves and let’s get into finding the best survival seeds and setting up the ultimate survival garden to see you through every eventuality. 4 Getting Specific – Why, What, How (much) and Where? Planning, planting, and managing a survival garden is about a lot more than simply having access to a reliable source of fresh produce at all times. At its core, your survival garden is an investment of time and care, hedging against the unknown developments of the future and ensuring that if things begin developing in the world around you, the security of your home food source is never affected, meaning you’ll retain access to nutritional requirements whatever goes down in the world around you. A survival garden which incorporates survival seeds into the sowing and growing plan builds a level of resilience into any wider home emergency food planning strategy and can form a key component to any comprehensive preparedness planning, making sure you have access to a dependable variety of food that isn’t shaken by volatility in the food supply chain. Knowing how to effectively and reliably grow your own food and build up a bank of survival seeds is a skill that countless generations have depended upon and is one that’s made all the difference in times of major adversity and conflict. 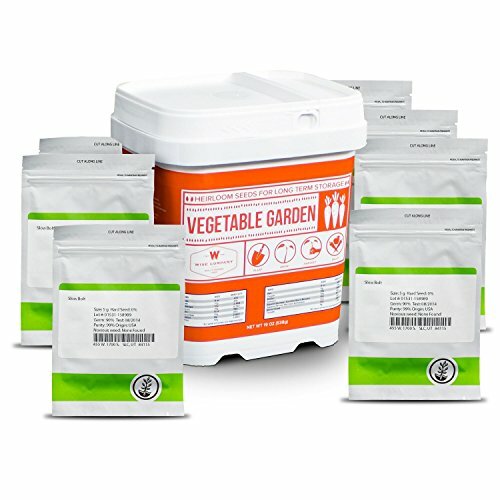 With this in mind, planting a survival garden from a stock of survival seeds and heirloom seed varieties becomes more than a preparedness strategy to call upon in times of need, it will arm you with the knowledge you need to have complete control over your personal food supply for a lifetime. Heirloom seed kits offer one of the very best ways to build a level of immediate redundancy into your home food preparedness planning. Unlike conventional seed varieties, heirloom seeds (arguably the best kind of survival seeds to invest in) come from open-pollinated plants which are able to pass on similar traits and characteristics from parent to child plants over generations. There really are a ton of reasons why you should ultimately consider heirloom seeds over conventional (see the section Benefits of Heirloom Seeds later in this guide), but from a survival gardening point of view, the primary factor that makes them beneficial is that seeds saved from heirloom fruits and vegetables will produce plants that (unlike conventional hybrid seeds) are true to type each year. Saving seeds from heirloom plants over a number of years, will mean you can begin to select seeds from the specific fruits and vegetables that are doing best in your garden, taking account for things like climate and soil, and eventually, ending up with plants which are more resistant to pests and diseases. What this means of course, is that you’re going to get a garden which delivers the true results each year, while providing you with control over how the plants develop over time. It’s with this in mind that many people consider heirloom seeds and varieties to represent a great choice when it comes to preparing a stockpile of survival seeds and planting a survival garden with high resilience against crisis scenarios. The best heirloom seed kits look to bring all of the benefits of this kind of open-pollinated seed together with the practical considerations of a preparedness solution that can be planted ahead of time, or called upon in times of potential adversity. A comprehensive vegetable garden should form the backbone of any survival growing strategy and the best vegetable heirloom seed kits will provide you with a wide range of varieties to ensure you’re able to grow the essentials for sustenance when planted each year. From naturally high, diverse nutritional benefit, to the variety and options that fresh produce introduces to any emergency meal planning, a survival garden and survival seeds for vegetables should form the mainstay of your emergency growing plan. On top of the obvious advantages of having fresh vegetables on hand during times of adversity, the incredible variety of ways to preserve and utilize a home-grown produce harvest makes this an obvious choice if you’ve got a plot of land or spare yard space to implement a survival vegetable planting strategy. In this part of the guide, we’ve taken a look at the very best survival seeds for planting a diverse, resilient, and nutritionally balanced vegetable garden that will keep you covered for years to come. 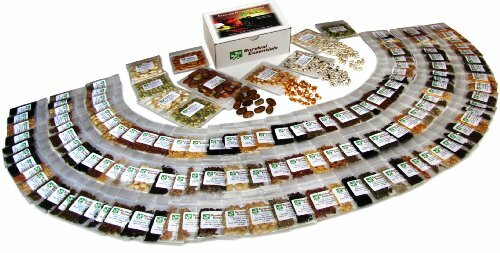 This incredible kit contains 135 varieties (over 23,335 heirloom seeds in total), of non-GMO, survival seeds covering everything from vegetables and fruit to medicinal and culinary herbs. If you’re looking for an ‘all-in-one’ heirloom seed solution to get your survival garden underway with minimal fuss, then this is undoubtedly one of the best solutions to consider. World renowned horticulturist and seed saver Suzanne Ashworth was consulted in the preparation of this seed kit and the included instructions, with the kit including detailed information on how to successfully store seeds going forward. The wide variety of survival seeds included in the heirloom Seed Bank has been put together to accommodate growing conditions across a variety of hardiness zones meaning you’ll have growing coverage no matter where you’re based. Wise Foods are probably best known for their excellent emergency and survival meal kits, but if you’re looking for a comprehensive set of survival seeds, then the brand’s range of heirloom seeds and survival seed kits contain a ton of variety and are perfectly packaged for storage as part of a home preparedness strategy or for easy transportation in a vehicle. Containing 16 individually sealed large packets of open pollinated, non-hybrid vegetable survival seeds, the Wise Foods Everlasting Vegetable Heirloom Seed Bucket provides enough plants for planning out almost 3/4 of an acre of survival garden. This heirloom seed kit include a good choice of the most popular staple vegetables including corn, onion, cabbage, spinach as well as many others. The non-GMO seeds in the Wise Foods kit are packaged within a Ropak bucket which is perfect for storing and transporting. When it comes to storage, you can expect the seeds in the Wise Foods kit to last up to 4 years so long as they’re kept at 66-70 degrees. As with the other best heirloom seed kits out there, you this shelf life can be extended by storing at lower temperatures. Each pouch of seeds in this kit is resealable and the total number of seeds included is equivalent to more than 100 average sized seed packets meaning you’re getting exceptional bang for your buck with these heirloom seeds. Containing 20 easy to grow varieties ranging from beans and beets, to cabbage and carrots, the Patriot Seeds Survival Seed Vault provides the essential heirloom vegetable seeds to get your planting underway in an easy to store, sturdy storage can. With a shelf life of up to 5 years, the Survival Seed Vault contains 20 kinds of 100% heirloom, non-GMO, and non-hybrid seed for crops which are high yielding and will deliver the results in most growing zones. If you’re looking for a comprehensive selection of heirloom seeds for planting out a survival garden, then the Survival Seed Vault is an excellent compact survival seed backup to build into your home preparedness strategy whether you’re looking to start your survival garden today or are just planning for tomorrow. With germination rates of over 80% within 5 years and over 50% for periods up to 15 years, this survival garden seed kit contains varieties which have been specially dried for an impressive shelf life making them perfect for home emergency preparedness and survival garden planning. 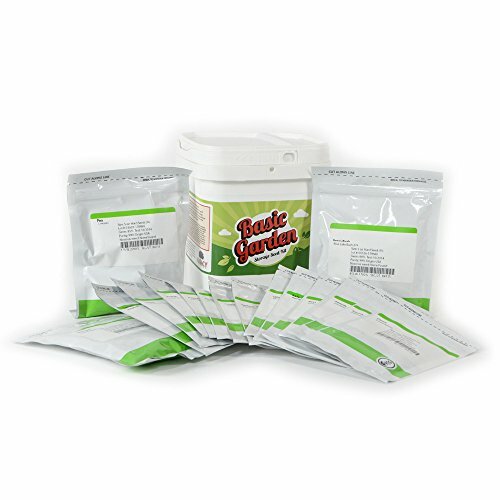 The survival seeds in this kit are open pollinated, non-GMO, heirloom seeds and come sealed in double thick Mylar packaging within a pest-proof bucket for durability and long-life storage until needed. If you’re looking for a survival garden seed kit that contains a wide range of open pollinated seeds at a low price-point, then this is a great choice for bolstering your preparedness stockpile with the supplies for growing what you need if the situation deteriorates. 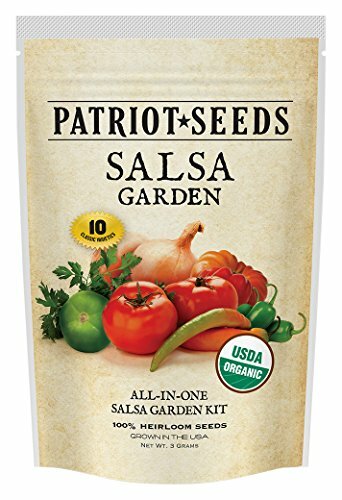 The Patriot Seeds Salsa Seed Kit contains 10 varieties of 100% organic, open-pollinated heirloom seeds that let you extend the range of your self-reliance strategy in the garden beyond basic fruit and vegetables. Providing high yield and germination rates in a wide variety of growing environments, the heirloom seeds in this kit are sealed in triple layered Mylar packets which means they’ll store for over 5 years. This selection of non-hybrid seeds will allow you to grow the key salsa fruits and vegetables to dramatically increase your survival garden or home food preparedness inventory. 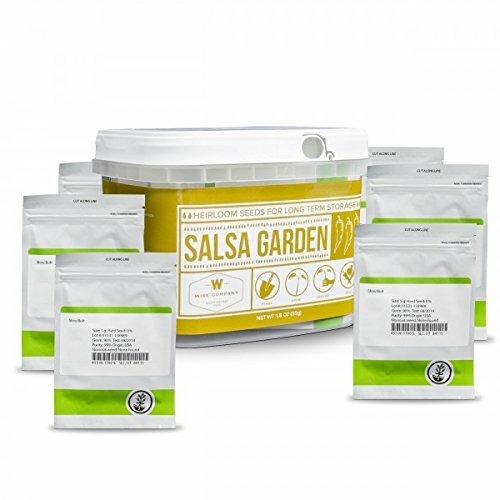 From tomatoes and onions to peppers and cilantro, the Salsa Garden Heirloom Seed Kit Bucket contains 10 open-pollinated varieties of survival seeds that can be harvested at the end of the growing season and then used for the next year’s planting. Each of the seed varieties is individually packed in a resealable pouch and comes with growing instructions, while the kit as a whole comes in a durable and portable Ropak bucket for storage and transportation. Tomato, Grande rio – 1,764 seeds. Having access to fresh fruit in a garden not only provides a wide range of vitamins and nutritional value, but also introduces essential variety to your growing repertoire meaning you’re going to be able to significantly increase the types of home-grown food that makes it into your daily nutrition. Growing heirloom varieties of fruit in a survival garden will make sure that your plants grow true every year and allow you to increase the resilience of your long-term growing strategy beyond just vegetables. The survival seeds outlined below represent excellent choices for building a solid provision of reliable, nutritious, and delicious foundation of fresh fruit into your survival garden plan. 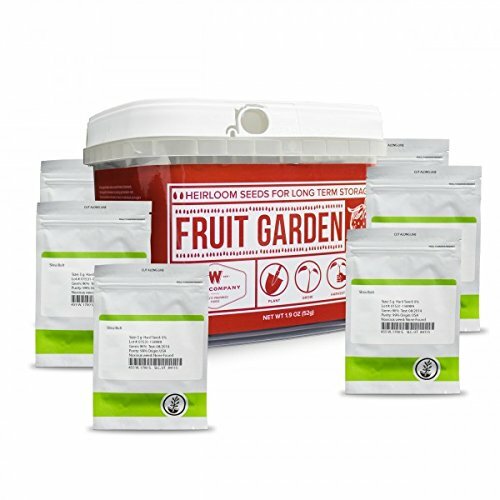 The Wise Foods Fruit Garden Heirloom Seed Bucket contains 9 varieties of fruit to allow you to significantly increase the offering of your garden and ultimately, providing more natural options to increase the breadth of your food and nutrition preparedness planning. As with the other heirloom seed kits by Wise Foods, the 9 seed packets in the Fruit Garden Heirloom Seed Bucket are individually packed and resealable for extending their lifespan and the entire kit is packed in a mini Ropak bucket which is perfect for shelf storage or carrying in a vehicle. Before planting, the seeds in this kit will keep up to 4 years if stored at 66 to 70 degrees, while keeping at lower temperatures will increase this lifespan even further. This heirloom fruit seed kit is an essential addition to any survival garden and will bring both nutritional value and flavor to your harvest. Depending on your specific objectives, the ability to plan out and plant a survival garden which is all-encompassing in terms of the flexibility of options it provides, should extend beyond fruit and vegetables. If you’re looking to plant a survival garden which is truly resilient, the ability to introduce ‘supplementary’ plants into your growing inventory will provide a lot of options over the long term. Building out your survival garden with an increased variety of ‘supporting cast’ heirloom seeds will provide an additional level of contingency to aid your nutrition preparedness requirements and significantly add to the strength of your planting strategy. In an emergency situation or during periods of prolonged adversity, you may find yourself needing to call upon either your survival garden produce, your emergency food stores, or both. If this happens, having access to a wide range of herbs can make all of the difference when it comes to extending the scope of your meals while bringing both flavor and additional nutritional benefit to your food planning strategy. 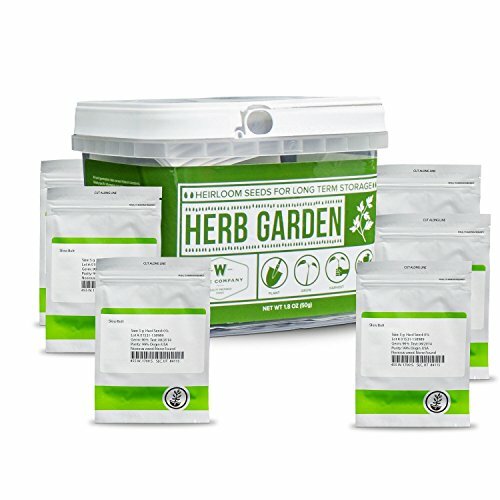 The Herb Garden Heirloom Seed Bucket contains 10 varieties of the most essential garden herb seeds in individually sealed (and resealable) packets, all stored within a durable mini Ropak bucket. All of the seeds in the this heirloom kit are non-hybrid open pollinated varieties and once harvested, can be planted in subsequent years. From Basil and Oregano, to Cilantro and Sage, this heirloom seed bucket contains the essential kitchen herbs to significantly improve your ability to add flavor to your food, whether it’s come from your home preparedness pantry, fresh from the garden, or simply picked up at the store. If you’re looking to build a food garden that provides resilience and flexibility, then including a comprehensive kit of heirloom herb seeds will give you a lot more options when it comes to preparing food in an emergency situation. Thyme, common – 22,046 seeds. If you suffer from allergies, have a cold, or suffer from any number of minor ailments, you may already be aware of the benefits of naturally growing medicinal herbs for helping to alleviate symptoms. The best medicinal herb heirloom seeds deliver the same long-term planning benefits of vegetables, fruit, and other herbs, but allow you to dedicate a small area of your garden to a patch of herbs which can be called upon to help you heal in uncertain times. The Medicinal Herb Garden Heirloom Seed Kit contains a selection of essential medicinal herb varieties for putting together your own natural complementary medicine for use alongside your regular supplies during times of strife. 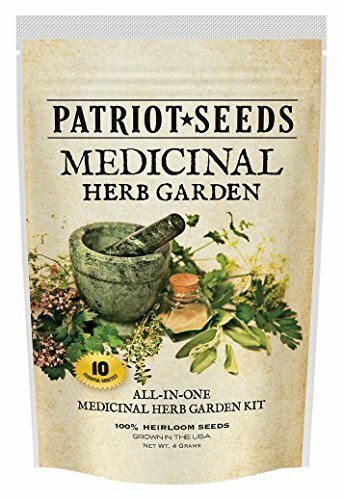 With 10 hardy varieties of 100% heirloom, open-pollinated, non hybrid, and non GMO heirloom seeds included, this survival seed kit from Patriot Seeds is an essential addition to both your garden and your medicine cabinet, containing a host of the very best plants needed to prepare your own tinctures and remedies from the medicinal and therapeutic herbs it will let you grow. If you’re looking to put together a holistic survival garden that considers all of the angles, then a medicinal herb patch should form a key component of your solution and this heirloom seed kit from Patriot Seeds is one of the best. 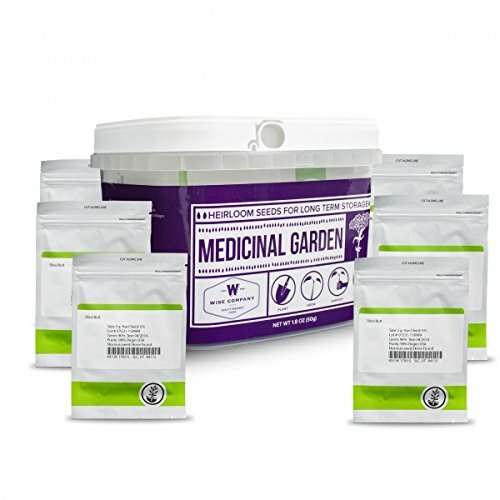 The Medicinal Garden Heirloom Seed Bucket from Wise Company contains 10 types of non-GMO medicinal herb seeds which are and is designed to provide you with a natural alternative to help alleviate symptoms when needed. All of the seeds in this heirloom kit are packaged in resealable pouches contained in a durable mini Ropak bucket for storage and transportation, offering a shelf life of anywhere up to 4 years when stored at the right temperature. When harvested at the end of the growing season, the non-hybrid nature of these heirloom seeds means they can then be used for planting the following year to keep your medicinal herb stores stocked up on a continual basis. Before you get started there are a couple of key things to think about when it comes to planning out a survival garden strategy and deciding on the best approach for your specific circumstances. From working out your requirements, to evaluating personal preferences, taking stock of your available land, and picking the best heirloom seeds and planting solutions for the task, there’s a lot to think about when putting together a survival planting plan. A Survival Garden needs to be Nutritionally Focused – In order to deliver true self sufficiency when food in the stores becomes unavailable, a survival garden needs to provide calorie dense nutrition which also provides protein and fat wherever possible as well as a well-rounded provision of vitamins and minerals over the longer term. The Crops from your Survival Garden need to be suitable for Long-Term Storage – Being able to preserve and store what you grow is critical after harvest, particularly over the non-growing season. While this is also an important factor in regular vegetable gardening, it can make the difference between eating and not eating in a survival situation. Your Survival Garden Needs to be Self-Replenishing Year after Year – When you bring the first harvest in from your garden, the ability to replicate the process for the next growing season isn’t a nice to have, it’s an essential requirement. With this in mind, a survival garden needs to be planned around a core of plants from heirloom, non-hybrid varieties that will deliver in future growing seasons, reliably and consistently. Survival seeds are therefore a crucial component to a survival garden plan and finding the best heirloom seeds is the key to this objective and presents some slightly different considerations to planting conventional seeds each year. There are of course other factors you’ll want to consider when planting a survival garden such as the size of garden required (determined by the quantity of food your family needs and the yield of your crops), the location of your plot (to remain inconspicuous to would-be thieves), and the actual ability to save seeds as discussed above, using open-pollinated or heirloom varieties of plants whenever possible. With these considerations in mind, you’ve now got the fundamental objectives of your survival garden in place and can begin looking at some of the finer details to get started. While it’s certainly possible to acquire a good nutritional spread if you’re growing enough of the right types of vegetables in a survival garden (protein through beans and pulses etc), this doesn’t mean it’s necessarily the most efficient way of ensuring you get enough calories, protein and fat into your diet. Ultimately, if you’re looking to start a survival garden, this objective should be a primary factor for consideration when planning for potentially lean times ahead. 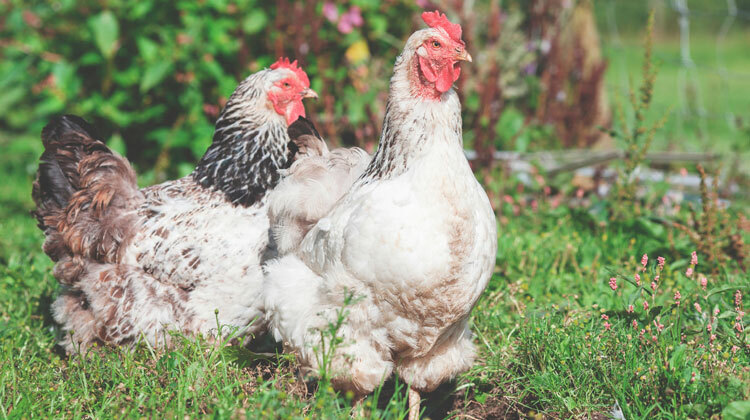 Therefore, if you have the ability to do so, it’s seriously worth also investing in chickens and learning how to care for them so you can rely on supplementing your survival garden produce with fresh eggs and the associated nutritional benefits. As well as the nutrition benefits provided by eggs, chickens can also be fed certain scraps (including vegetable peelings) and also serve the purpose of acting as an excellent way to keep pests in your survival garden under control as well as providing a ready source of natural fertilizer for your plants. A clear focus on overall nutrition provided should form the core of your survival gardening strategy and guide the decisions you make regarding what to grow and how best to utilize your crop after harvesting. When looking at survival gardens and gardening in general, it’s important to understand some of the specific terminology associated with plants to get a good idea of how nature deals with the whole growing and sowing thing. One of the key ideas to get a handle on is the difference between annual plants (those that have to be replanted every year) and perennials (plants that grow year on year without needing to be planted again each time). When a perennial is planted, it can in theory grow and produce food almost indefinitely without needing to be replanted year on year. Annuals on the other hand require replanting each year from seed and so there’s an extra step and requirement on the grower to make sure that seed is stored and resown to continue the crop every year. Most vegetables you’re likely to plant in a survival garden will be annuals and while there are some exceptions to this rule with a couple of perennial plants – berry bushes (raspberry, blueberry etc), asparagus, rhubarb – you’re going to want to make sure that you’re laying down plants which you’ll be able to resow from seed next year. So, if you just need to replant seeds from your vegetables every year that’s pretty simple right – save a few seeds, sow again next year, harvest, rinse and repeat annually? Unfortunately it’s not quite that straight forward – Unless you’re growing from open-pollinated seeds that is. See here’s the rub, while most seeds you pick up in the store will (if planted and cared for) produce great results during the first year or so of growing, after that, things start getting a bit less certain in regards to yield. Survival gardens need to be built around the core concepts of reliability, sustainability and continuity, and with this consideration in mind, your seeds need to deliver the goods year after year – they need to be ‘open-pollinated’ varieties. You may have come across the term ‘heirloom seeds’ in the past, but what exactly does it mean? Heirloom seeds are basically just a type of open-pollinated seed that have been passed down, and as with all open-pollinated varieties, they retain the genetic information of the previous generations of plants. In a nutshell, this means that ensuring you have open-pollinated seeds (heirloom or not doesn’t really matter) will mean you can save and reuse your seeds each year without problems. Survival seeds have an incredibly simple primary objective – to enable you to plant a garden which will provide you with a reliable and sufficient source of nutritional benefit in an emergency survival situation. With this in mind, the best survival seeds are going to be those which deliver reliable results time after time (unlike conventional seed varieties which can’t be counted on to stay true after each subsequent generation of planting. It’s due to this that heirloom seeds are often viewed as the best kind of survival seeds as they carry across the true characteristics of parent plants when sown in subsequent years. Of course, you may choose to keep a large supply of conventional seeds in storage and sow them each year until you’re out, however this will often deliver sub-optimal results as the seeds you hold in storage begin to age which can subsequently result in lower yields. Getting Specific – Why, What, How (much) and Where? Survival gardening is about quite literally laying the groundwork for a suitable level of food self-sufficiency further down the line for times of uncertainty and potential food insecurity and as such, looking at the details of what you and your family need forms the backbone of any strategy of survival and self-reliance garden planning. It’s important to establish the main reason you’re thinking of planning a survival garden to help you better understand what you want to get out of your crop and to identify the most practical and efficient way of meeting your goals. Are you looking to drastically cut back on your current food spending and dependence on store bought produce? Are you implementing a survival gardening strategy to hedge against uncertainty in the future? Ultimately, growing a survival garden will, to a certain point, achieve both of these objectives simultaneously, however the specific reasoning behind getting started will still influence how you roll out your gardening plan and will determine factors such as what to plant and where to grow your crops. If your survival garden is going to represent a full-spectrum food replacement strategy, then the emphasis on maximum energy benefit and total nutritional value from your crops will take priority, alongside the ability to store (and protect) what you grow. 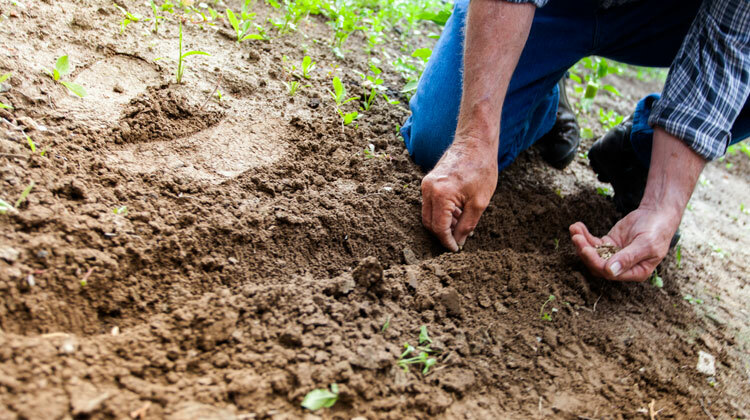 Firstly, consider how many people your survival garden will need to provide for and then begin drilling down into the specific requirements per person. A good way to get started with this is to analyze your existing daily food consumption and grocery spending habits. How much do you eat on a typical day and what does this look like on a calorie for calorie basis when compared to vegetables. If you had to fall back on minimal rations in an emergency situation, how many calories would you and your family require? Check out your receipts to get an idea of where your food spend goes and look at the meals you cook during a typical week. Once you’ve decided on your main goals for survival gardening and thought about the yield requirements for your specific needs, you’ll then be able to start pinning down the vegetables and fruit that will make up your organic arsenal in order to find the best survival seeds to make it happen. The great thing about survival gardening is that once you know your specific requirements and the constraints or opportunities of your growing site, the options for what to grow are wide ranging. What you intend to grow and how much you think you’ll need to meet your nutrition requirements are really the main things that will determine what you’re going to need in terms of space and the land requirements for your survival garden. With that being said, the obvious thing which has the ultimate influence on this is the actual availability of space you have when it comes to allocating a patch of land to growing your survival garden. Below are some of the most likely scenarios and options to explore if you don’t currently have access to your own suitable piece of land. If you have the space to dedicate a suitable part of your own backyard to growing, this is undoubtedly one of the best options for starting your survival garden given the closeness to your actual home and the ability to bring your produce straight to the kitchen or a specific storage area once harvested. Depending on how close you live to others – particularly if you have neighbours in close proximity – can represent a drawback to planting a survival garden in your backyard and should certainly factor into the equation if your ultimate goal is to provide a secure and reliable source of food during adverse conditions. Owning a parcel of land that’s geographically separate from your property or home can provide an excellent opportunity both to grow your own food and also as a potential bug out location if you need to pack up and evacuate your home in an emergency situation. One of the major advantages of owning a piece of land (assuming it’s relatively secluded) is that you’ll benefit from a degree of concealment that simply may not be available to you when planting in your own backyard or near other people, where the risk of losing your crop to those less prepared than yourself will be far greater if times are bad. The trade-off here of course, may come in the form of practicality, with the physical distance from your house potentially making this more of a challenge. Whether you already have a piece of land outdoors, or live in an apartment, there are multiple ways to maximize your potential for growing produce indoors. From a no-nonsense planting solution such as a grow bag or pots, to a self-watering smart planter, freeing up floor, shelf, or windowsill space inside your home is a great way to build additional produce growing space into your home preparedness strategy. Remembering that anything is better than nothing, the ability to grow even the smallest amount of your own food inside your property can make all the difference if you’re looking to extend the effectiveness and range of a conventional food storage supply or pantry. 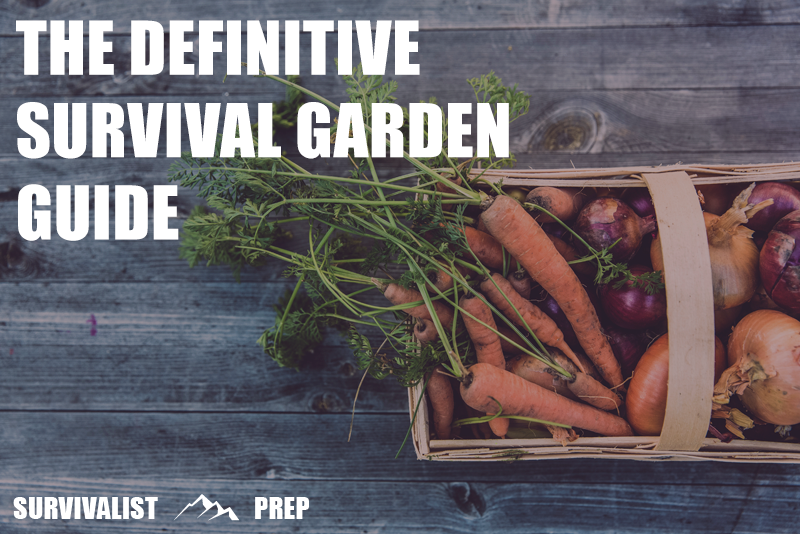 As with all of our preparedness guides, we reference as many expert sources, real world user reviews, and opinions as possible so we’re able to provide the most relevant and educational information on how to prepare and grow a survival garden. Preparing a survival garden and finding the best survival seeds or heirloom seeds for the job is ultimately a highly personal activity with individual needs and preferences sometimes varying considerably between people, locations, and specific situations. With these considerations in mind, this guide looks to provide advice on our own opinions of how to plan and grow a survival garden and find the best survival seeds and heirloom seeds for a variety of uses, however, it’s always important to carry out your own due diligence to find the best growing solution for you when developing a strategy, plan, and survival garden solution that’s perfect for your situation.